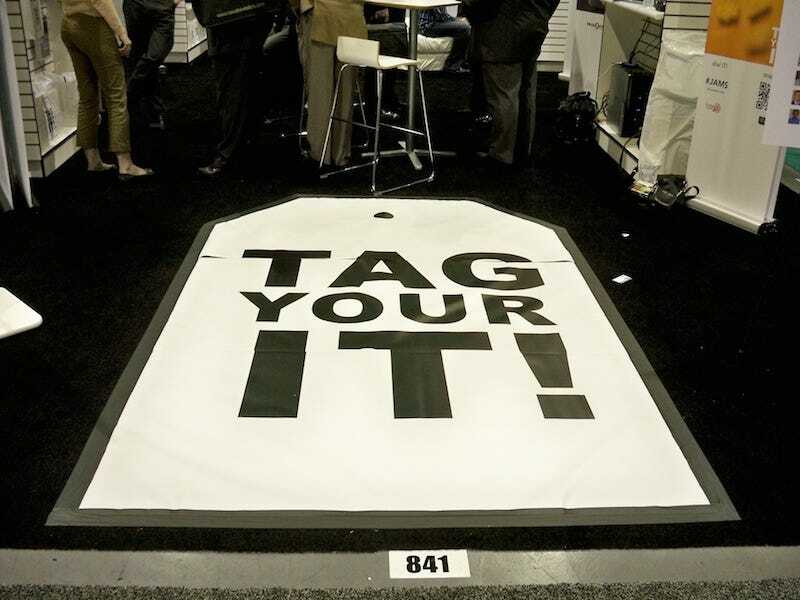 Unfortunate Corporate Slogans, Nokia Edition: TAG YOUR IT! No, this slogan isn't a typo, and yes, the English-speaking Nokia reps were extremely embarrassed about it. The best part? The phrase is written everywhere at this booth, from t-shirts to rebranded cans of soup. More idiom-related wackiness post-jump. The tagline is actually advertising Nokia's "Point and Find" service, which is a sort of user- or corporate-generated phototagging system combined with a barcode tagger. Take a picture of your shoes, or a painting, or whatever, add in a link to its Wikipedia page or shopping link, and then whenever anyone snaps a photo of that item, they'll see your links. But retail companies can also tag their own products, so the system can be used for any item in their stores, and if worse comes to worst, you can always just scan a 2D barcode. The slogan idea is kind of a ripoff of those eBay ads from three years ago that used the tagline "Find Your It." Unfortunately, whoever decided on "TAG YOUR IT" evidently did not go to elementary school in an English-speaking country.